1. The Proper Golf Grip - Golf is like any other sport when it comes to practice and repetition. You need to practice to become better, and It all starts with how you hold the club. Find a comfortable grip and take several practice swings to see how it feels. Having an uncomfortable grip will result in bad shots so you want to get the right feel on the club to have a better chance to hit a good shot. Here is a great video of a step by step guide to the perfect golf grip. 2. Posture and Approach - Speaking of being comfortable, this is one of the most important parts of golf. The typical golfer wants to bend their knees, with their upper body leaning slightly over the ball, with your arms out in front of you. Your feet should shoulder length apart and the ball should be positioned in the middle of your stance. 3. Putting - In many people’s opinions, the most important skill to have when playing golf is being able to putt. Putting is where the money is made. “Drive for show, putt for dough”. Putting is all about touch and tempo. Most people think putting is easy because they have played mini-golf but in real golf, there are no bricks to bank off of. Check out some putting tips here. 4. Chipping - Having a good short game is definitely a key skill to have when trying to keep your score low. We all miss greens, and to get up and down will give you the confidence you need to continue to play well. Most times you will use a wedge when near the green because of the loft of the club. Put the ball in the back of your stance and take a light to moderate swing (depending how far you are away from the hole). Try and keep a triangular motion with your arms and let the club do the work for you and keeping this routine will help get you closer to the hole. 5. Etiquette - The history of golf dates back to the 15th century and since then, golf has been a game of honesty and integrity. No one likes cheaters and everyone wants to respect the game and play it how it is supposed to be played. Etiquette is a key part of continuing the success of the game. Every course has their own guidelines and best practices but you should always respect your playing partners and golfers around you. 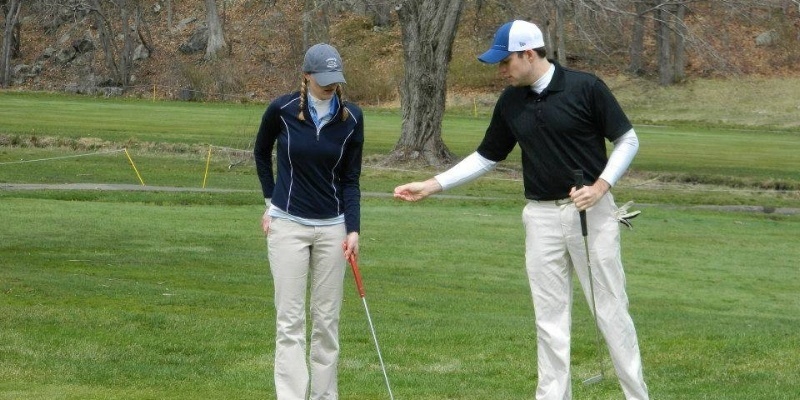 The PGA has a great list of Golf Etiquette tips to refresh you and your friends. After reading through this, head over to the closest driving range and start practicing so you will be able to compete with friends and family at your next golf outing. You won’t master the game after one range session so steady practice and commitment will go along way. Good luck to you this season and go low!